Nomura Group, a Japanese financial services company, is now the proud owner of London's first carbon neutral building. Located on the north bank of the Thames at One Angel Lane, Nomura's UK headquarters is an incredibly energy-efficient building topped with green roofs and photovoltaic panels. London-based Fletcher Priest Architects designed the office building while carefully considering energy use, materials, waste, biodiversity, water use, the community, and resource conservation during both demolition and construction. Nomura’s office is built on the site of a former project that makes use of 30% of the existing infrastructure as a way to reduce impact, resources and costs. The project also increased public space along the river by 30% and includes a new accessible bridge link over Upper Thames Street, an enhanced Riverside Walk, and the largest riverside square in the City of London. The office itself is a five-story timber building reminiscent of historic wharf structures that features a responsive timber-louvered shading structure on the inside to help keep the interior cool. The 800,140 sq ft building features multiple green roofs – the main roof is covered with sedum and photovoltaic panels, while the other two are landscaped grassed terraces. 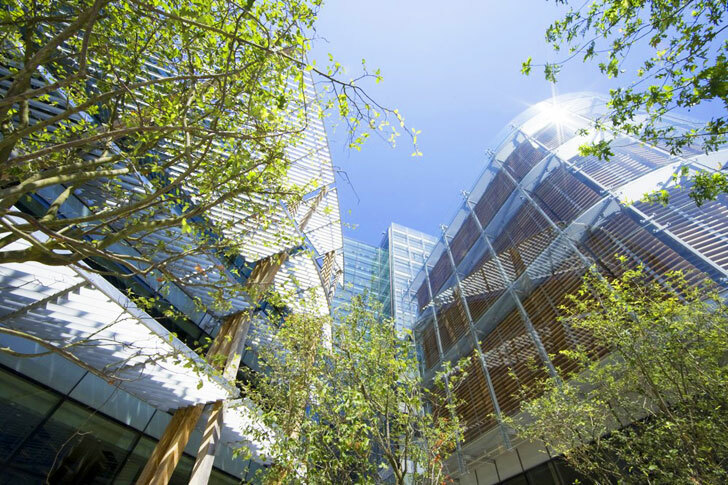 One Angel Lane takes advantage of solar passive design and a high-performance facade to reduce its energy consumption by half compared to an equivalent benchmark building – and it creates its own energy to meet the other half of its needs. The company has implemented a number of sustainability strategies including waste recycling systems, cycle to work schemes, carbon working groups, and environmental representatives. A group of volunteers has also planted a kitchen garden, which harvests vegetables, fruits, and herbs to be used in the dining area. In addition, the firm has partnered with The Golden Bee Company to host two bee hives on the roof. Fletcher Priest Architects and Nomura have won a number of awards for their project since its completion in 2009 including the LDSA (London District Surveyors Association) Building Excellence Award 2010 for the Best Sustainability Project and the Local Authority Building Control National Building Excellence Awards – Best Sustainable Project. Nomura's office is built on the site of a former project that makes use of 30% of the existing infrastructure as a way to reduce impact, resources and costs. 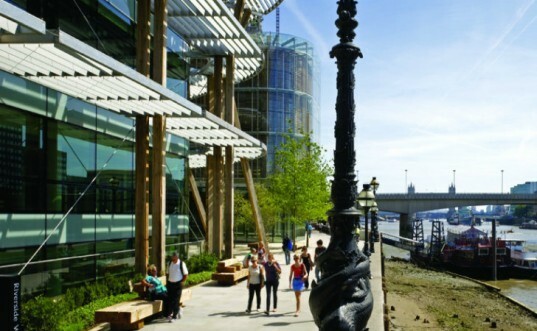 The project also increased public space along the river by 30% and includes a new accessible bridge link over Upper Thames Street; an enhanced Riverside Walk; and the largest riverside square in the City of London. The office itself is a five-story timber building reminiscent of historic wharf structures that features an responsive timber louvered shading structure on the inside to help keep the interior cool. The 800,140 sq ft building features multiple green roofs - one on the main roof with sedum and covered with photovoltaic panels, while the other two are landscaped grassed terraces. Besides solar passive design and a high performance facade, One Angel Lane uses half the energy consumption of an equivalent benchmark building, and supplies the rest themselves. The company has implemented a number of sustainability strategies including waste recycling systems, cycle to work schemes, carbon working groups, and environmental representatives. A group of volunteers has planted a kitchen garden, which harvests vegetables, fruits, and herbs to be used in the dining area. In addition, the firm has partnered with The Golden Bee Company to host two bee hives on the roof. Fletcher Priest Architects and Nomura have won a number of awards for their project since its completion in 2009 including the LDSA (London District Surveyors Association) Building Excellence Award 2010 for the Best Sustainability Project and the Local Authority Building Control National Building Excellence Awards - Best Sustainable Project.